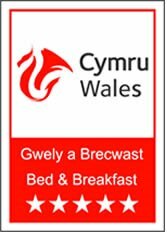 Fabulous 5 star Bed & Breakfast in the beautiful village of Llanfihangel-y-Creuddyn. Y Grange offers 3 ensuite guest bedrooms a games room with 10ft snooker table, and a jacuzzi for guest use. Fantastic views of the surrounding valley and only 10minutes from the university town of Aberystwyth and 30 minutes from the stunning coastal town of Aberaeron and the wales coastal path. Have a look at our local area page to find out more about things to do and places to visit around the area.